I've chosen for this week's prompt to highlight the life of my maternal great grand aunt Lillian Harrison Barrow. During her lifetime she went through a few different name changes because she was married 4 times. Her date of birth according to her gravestone was July 12, 1899. The day and month I believe are correct but the year was probably closer to 1896 or 1897 based on her age on the 1900 census. She was one of nine children born to Thomas Duke Harrison and Mary Jane Williams in Wilmington, NC. 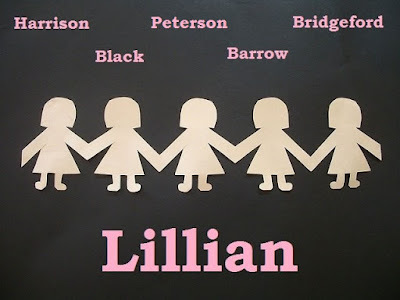 So name number one was Lillian Harrison. Next, she become Lillian Petersen sometime prior to 1920. Apparently she married a gentleman with that as his last name. Here's the problem. Source Information: Ancestry.com. 1920 United States Federal Census [database on-line]. This is the only entry I've found for her in the 1920 census. She was recorded living with her parents but where's the husband? I found in Ancestry.com's North Carolina Marriage Records 1741-2011, an entry from 1918 in Beaufort County for a Henry Peterson who married a Lillian Harrison. The Lillian featured in that entry was of the right approximate age but I have no other info to confirm that this in fact was my "Lillian" Anyway, name number two was Peterson. Next up was the surname Bridgeford. Now this one I learned of from a newspaper article I came across while researching Lillian's father Thomas Duke Harrison. Mrs. Lillian Bridgeford, wife of Mr. William Bridgeford, Baltimore, MD., formerly of Norfolk was a visitor in the city enroute to New Bern, NC, to visit her parents, Rev and Mrs. T D Harrison. --from the Norfolk Journal and Guide, July 20, 1929, Page 4. ... Lillian was married again! This time her husband's name was a William Black. According to the 1940 census, the couple had resided together at the same place since 1935. Perhaps Thomas Duke Harrison didn't like the looks of husband number 2, William Bridgeford, back in 1929 when Lillian and him made a visit home to New Bern. Perhaps he simply died. If you look at the census entry again you will see the name of Lillian's 4th and final husband. Lee T Barrow was listed as a lodger living with Lillian and her 3rd husband in 1940. The curious thing about all this is that I haven't been able to locate marriage records for Lillian's last 3 marriages. Lillian Harrison Barrow died December 19, 1996. She's buried next to her husband Lee T Barrow at Garrison Forest Veterans Cemetery in Baltimore County, MD.